This week at SpockSoc, we’ll be kicking off Alphas season two! 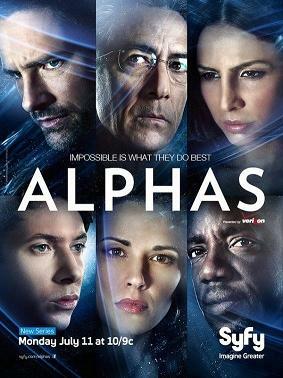 The series follows five people with superhuman abilities, known as “Alphas”, led by noted neurologist and psychiatrist Dr. Lee Rosen (David Strathairn), as they investigate criminal cases involving other suspected Alphas. Rosen and his team operate under the auspices of the Defense Criminal Investigative Service, the criminal investigative arm of the U.S. Department of Defense. While investigating these crimes, it does not take the team too long to discover that a group known as “Red Flag”, which was thought defeated and eliminated long ago, is using other Alphas to commit crimes. Starting at 5pm this Friday in ChemSci M18 as usual – pizza run at about 7pm.